Walking into the new Tate Modern is like walking into a new city. It’s vast. Absolutely vast. Bankside has always been a huge space, in which a lonely visitor can sometimes rattle about like a small fork in a big drawer — especially in the cavernous emptiness of the Turbine Hall when there’s nothing much in it. But with the opening last week of the £260m extension, this sense of bigness has significantly increased. It’s a sensation you feel most keenly up on the dizzy skywalk that joins the new bit of Tate Modern to the old. Walking out high above the Turbine Hall, you find yourself looking down on Ai Weiwei’s freshly acquired Tree, far away in the distance. It’s actually 22ft tall, and made of iron, a monstrous sculptural presence whose branches loom over you and threaten your skies. At the Royal Academy, in Ai’s show last year, a gang of such trees created the intensely claustrophobic sensation of being lost in a rusty technological forest. But at Tate Modern, looking down from the new Flash Gordon footbridge, Ai’s Tree looks tiny: a distant weed growing up through the cracks in the concrete. Apart from the big increase in scale, what else does the monstrous sum of £260m buy you? A lot of beautiful foyers is one answer. All the way up Herzog & de Meuron’s elegantly twisting new ziggurat, there are wide and lofty spaces in which the public can meet, gather and ready itself for the experience of looking at art. So numerous are the fab foyers that the galleries they introduce appear surprisingly modest. On paper, the extension has increased Tate Modern’s display area by 60%. But it just doesn’t feel like it. Of the 10 new storeys, only four contain art. The rest are bars and restaurants, shops, conference spaces, offices, members’ rooms and, at the top, a superb outdoor terrace offering vertiginous views of London below. When I finally reached it, I welcomed its drama, because drama is frequently missing in the galleries themselves. In architectural terms, the rebuild has resulted in the slicing of the Tate Modern experience in two. The original building, rechristened the Boiler House, tells the story of art in the 20th century with a series of jumpy thematic glue-togethers. The new extension, the Switch House, is devoted to art since 2000, the year Tate Modern opened. Separating them is the Grand Canyon that is the Turbine Hall. The gallery has, therefore, achieved some vast symmetry. But the bigger question here — what story does the collection now tell? — is hard to answer. As ever in Tate displays, everything is arranged in themes, and the search for thematic paths through the gallery’s uneven holdings results in galleries that are jumpy, partial and inconclusive. Tate Modern’s new director, Frances Morris, whose vision is embodied by this rehang, has, however, brought two important ideas to the table. The first is the dramatic foregrounding of women artists. For the first time in any notable international museum, the output of women has been given equal space and billing to the output of men. 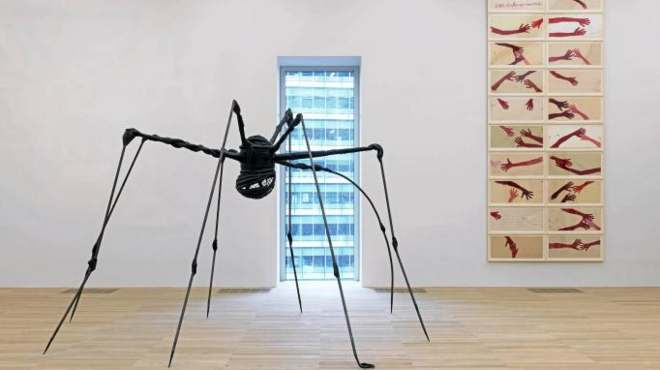 In some instances, as with the room devoted to Louise Bourgeois, the results are welcome, but hardly surprising. These days, Bourgeois is recognised universally as a giant presence in postwar art. Elsewhere, the deliberate foregrounding of women artists confronts us with some unfamiliar presences. Few will have heard of Ana Lupas, the veteran Romanian who makes village art out of straw. Or the Finnish photographer Sirkka-Liisa Kontinnen, who lived on the Byker estate, in Newcastle, and photographed her fellow inhabitants so fondly. Given their own spaces, these female strangers are substantial presences in the new displays: more substantial than the familiar modern-art names on the other side of the footbridge. Picasso, for instance, who bobs up here and there in a thematic display that looks at the way artists’ studios have had an impact on their output, feels like a minor and scattered figure. I never believed his great Weeping Woman could ever be diminished by its surroundings, but that is what happens. All the traditional isms have been ignored, and national differences eradicated or sidelined. By arranging the Tate collection in thematic clusters — In the Studio; Artist and Society; Materials and Objects; Media Networks — the Boiler House encourages the public to join up their own dots as they bounce from sight to sight. Thus the story of 20th-century art ceases to be a story at all, and becomes instead a series of hit-and-miss gallery experiences. Morris’s second driving idea is to play down the contributions of America and western Europe, and to scour the world for little-known artists. It’s an excellent ambition, and long overdue. But here, too, there are problems. These days, living in Ghana or South Africa can be little different, artistically, from living in Peckham. The subject matter may change from country to country, but most of the artistic foreigners discovered here speak the same language as everyone else. When it comes to colonisation, no invading force in history can have been quite as successful as contemporary art. There is less video than I was dreading, but a special emphasis has been placed on performance and its influences. In some instances, this requires live events to take place in the gallery — I saw only the rehearsals, so it would be unfair to comment on them — but, more commonly, what we get is the art created by performances in the past. Roni Horn’s room consists chiefly of the creepy props she used in her actions, while Lupas, who cannot be represented by the straw sculptures she made in the 1960s, shows us sepia-tinted photographs of them, and some moody tin casings in which the originals are apparently preserved. So it’s all very informative. But also rather worthy, and often dull. The documentary nature of many of the exhibits gives us plenty to read and ponder on, but little that knocks us out. Sepia photos are all very well, but they are never a substitute for the actual experience. This well-meaning hang left me hankering for excitement. The YBAs are nowhere to be seen. No Sarah Lucas. No Jeff Koons. Very little Warhol. Duchamp is represented only by a replica of his notorious urinal. There’s little childishness and no vulgarity. No Chapman brothers. No Tracey Emin. No Grayson Perry. Nothing Hogarthian disturbs the Tate’s careful international politeness. On the ground floor, in the lofty spaces of the Tanks, there will be a continuous cycle of performances and interactive artworks. Indeed, so keen is the opening display on interacting with the audience that the largest of the Tank galleries contains working replicas of things in the collection by Rasheed Araeen, Robert Morris, Charlotte Posenenske. The originals are too precious, but the replicas can be handled, as the artists intended. All this is par for the course when it comes to the display and meaning of international contemporary art. These days, audience interaction and the popularity it triggers have become the be all and end all. Tate Modern is doing nothing different from what today’s art lover will see at any biennale or art fair. But the effects of all this interactive politeness are curiously dampening. It isn’t only Picasso who seems diminished by the well-meaning thrusts of the new arrangement. Carl Andre’s bricks have gained a so-whatishness they did not previously have. Even Bourgeois could have been represented by wilder, edgier works than the ones gathered in her main room. It is left to her cabinet of curiosities next door to feel creepy, edgy, transgressive. High on good intentions, low on excitement, colour, vibrancy and vulgarity, the new Tate Modern feels like a gigantic corporate headquarters for the huge multinational concern that is contemporary art. Having wandered about the enlarged space for many hours, I find myself remembering its foyers more accurately than most of its exhibits. To paraphrase that sworn enemy of the Tate, Brian Sewell, we have here an ace set of foyers with some nice galleries attached.